I was shopping online for Christmas cards when I saw a link of Snapfish for free printables... and they are SO cute! From banners to bottle labels, and napkin rings to table tents - everything you need to print off for an adorable party... for FREE. 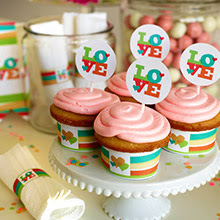 Cheerful stripes and bold L-O-V-E messages abound in this Modern Love Party Kit. From banners and bottle labels to masks and fancy fingernails, you’ll find just what you need to throw a sweet party full of hugs and kisses.